Jesse Rodriguez isn’t your average student by most measures. An Honors student triple majoring in mathematics, physics and nuclear engineering, he has sometimes worked his way through 10 classes per term and excelled in them. While an unending stream of mathematics and physics classes may well intimidate even students with high academic aptitude, they have only served to make Jesse dive in for more. In fact, it was a tough physics class with an even tougher exam that made this nuclear engineering major decide his undergraduate life would be incomplete without a degree in physics. “I took my first physics course with Chris Coffin—the second in the series of physics with calculus classes for engineering majors. The exams were notoriously difficult. And I just loved how difficult they were. There is nothing more exciting to me than tackling a hard problem,” Jesse said. It wasn’t long before he found himself falling hard for the mathematics courses at Oregon State University and adding a third major. Oregon State has been an ideal place for the ambitious and hard-working senior in more ways than one. Jesse had spent a term at the University of California-San Diego as a first-year structural engineering major. When he wanted to add a minor in physics, much to his disappointment, he was dissuaded from doing so. 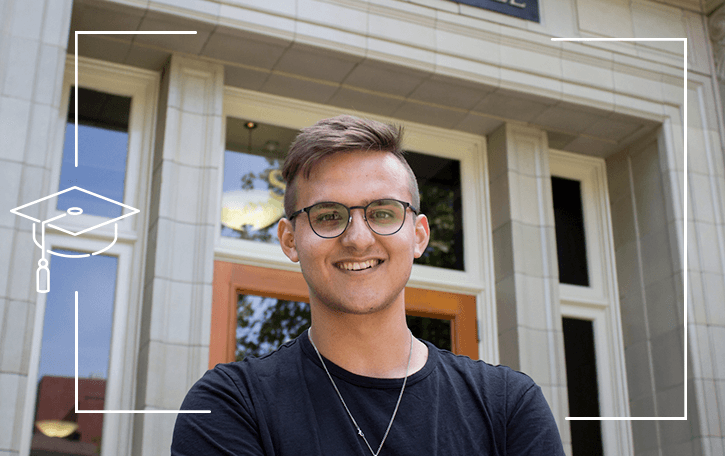 Since he had been offered admission at OSU, Jesse transferred here with the purpose of following his heart’s desire to study a combination of applied physics, nuclear energy and mathematics. At every turn at OSU, Jesse only encountered support and encouragement from advisors and professors as he followed his academic inclinations. Jesse marvels at how comparatively easy it was at OSU to broaden his academic horizons. Jesse’s journey towards becoming a mathematics major started for a sole reason. He was excited by the idea of taking an upper-level/graduate class on general relativity taught by one of the most celebrated mathematics professors on campus, Tevian Dray. The class had a lot of prerequisites, and Jesse set about adding them to his schedule. After taking a modern algebra course, which turned out to be his first encounter with abstract mathematical structures as well as a fantastic experience, Jesse realized he could take an additional four or five courses and become a math major. While a normal course load is 16 credits or four courses per term, Jesse has taken a breathtaking 26-27 credits, enrolling in a staggering number of courses—sometimes 10 different classes per term—to accommodate major requirements in all three fields. The maximum number of credit hours for a full-time undergraduate student are 19. Jesse had to petition to obtain permission for the extra credit hours. While he found the experience grueling, Jesse says he wouldn’t have it any other way. “I went to extreme lengths. But it was an amazing experience to be taking those classes in three different majors without much of an overlap in course requirements, which is what led me to take so many classes,” observed Jesse, who is enrolled in six courses this term. The indefatigable student is a little disappointed that only three of those courses are demanding! “I wish I had a couple more tough classes to challenge myself and learn a bit more before I left for graduate school,” he ruefully added. Jesse enjoyed an incredible and wide-ranging learning experience where his classes in the different subjects led him to many wonderful insights about the deeper connections among his majors, and ultimately to a more solid understanding of science itself. Math may be abstract but the subject has fundamentally altered Jesse’s perspective on the world and has inspired him to take a closer look at natural phenomena. “Once you begin to enjoy learning, it is an amazing experience, because you start seeing things and they make sense. I can look at a rainbow and think about how that is physically happening and try to calculate what angle that should occur at if the sun is behind me. I can take a piece of paper and calculate that angle. To be able to interact with the world around you in this fashion is so rewarding,” observed Jesse. Jesse’s all-consuming passion for mathematics and science are taking him places. After graduation, Jesse will head to a Ph.D. program to undertake research in plasma physics at Stanford University as a Department of Energy Computational Science Graduate Fellow (DOE CSGF)—a highly prestigious fellowship that provides four years of financial support with a stipend of $36,000 per year. This DOE fellowship trains the next generation of leaders in computational science who use math and computers to advance scientific discovery. Jesse is one of only 26 fellows chosen from across the country for the DOE CSGF incoming class of 2018. He was also offered admission to other prestigious graduate programs including MIT but ultimately decided to attend Stanford. For Jesse, who had had been turned down by Stanford for undergraduate studies, the achievement is the culmination of a cherished dream. Jesse has come a long way from his first term as a structural engineering major at UC-San Diego when he wanted to join his father’s construction company in Salem after graduation. Now he is all set to become a plasma physicist with aspirations to make solid contributions to the field. This first-generation college student is proud to have fulfilled the hopes and dreams of his parents. Jesse’s father emigrated with his family from Mexico, first moving to Los Angeles and then to Oregon in search of farm work. His mother grew up in the small city of Independence, Oregon. No one went to college on either side of his family. Jesse says both his parents had very little growing up and instilled the importance of education and the value of hard work in their three children. Naturally good at math and science, Jesse was, by his own admission, an indifferent student until he attended an engineering conference at the University of California, Berkeley, in high school. He worked on a presentation on nuclear fusion and its potential for sustainable energy, which planted the seeds for his academic interest in nuclear physics and engineering. The turning point in Jesse’s undergraduate career occurred after a vector calculus class in his sophomore year: mathematics professor Juan Restrepo invited the talented student to assist him on a research project. Jesse spent his summer working on a mathematical computational model to explain subsurface flows in granular material and why wet sand dries out under footprints on the beach. This very first research project set off a cascade of fortuitous events. Restrepo encouraged Jesse to present his research at the Society for Advancing Chicanos/Hispanics and Native Americans in Science (SACNAS) Conference in Washington, D.C. At SACNAS, he learned about REUs (Research Experiences for Undergraduates)—the most valuable summer experiences for undergraduates considering a Ph.D. among other career paths—from a Stanford graduate student and how they could prepare him professionally for life as a scientist. After returning from the conference, Jesse busied himself with applying to several REU projects. The following year, Jesse was selected for his first REU in the Department of Astronomy at the University of Chicago. Working alongside students from other universities to measure the absorption spectra of hundreds of stars, Jesse got his first taste of collaborative research in a top-notch research environment. The following year, Jesse ended up in the same plasma physics lab at Stanford as the graduate student that he met at SACNAS and who had encouraged him to apply there. Bringing things full circle, this is the very same lab where Jesse will continue his research as a graduate student. Jesse measured the velocity profile and magnetic field fluctuations of the plasma deflagration gun at the High Temperature Gasdynamics Laboratory at Stanford in order to characterize the instrument as a platform for future research and gain significant insight into the dynamics of laboratory plasma jets. Jesse’s research forms the basis of his undergraduate Honors thesis. Thanks to that first research experience with a mathematics project at OSU, Jesse found his path to undergraduate research early on, saving precious time and accumulating extensive as well as diverse lab experiences before graduation. “I would like to thank Dr. Restrepo for the huge part he played in my growth and opportunities as an undergraduate student. The connections I made through SACNAS and the REUs pointed me in the right direction to secure a spot in the plasma physics lab and build up a rapport at Stanford while researching the subject that I have been most excited about since I was in high school,” said Jesse. Although balancing three majors and several research projects hasn’t been easy, Jesse has managed to do it all. He was awarded the 2017 Botond Gabor Eross Math Memorial Scholarship for outstanding performance in mathematics at OSU. Jesse has also received the John Grund Memorial Engineering Scholarship from the nuclear science and engineering department for achieving excellent grades in his engineering courses. “My parents are obviously very proud of me. All they worried about was giving us the opportunities to do well. They take pride in what I have been able to accomplish with their love and support,” said Jesse as he moves toward a bright future replete with mathematics and physics but grounded in the tradition of OSU Beaver excellence.